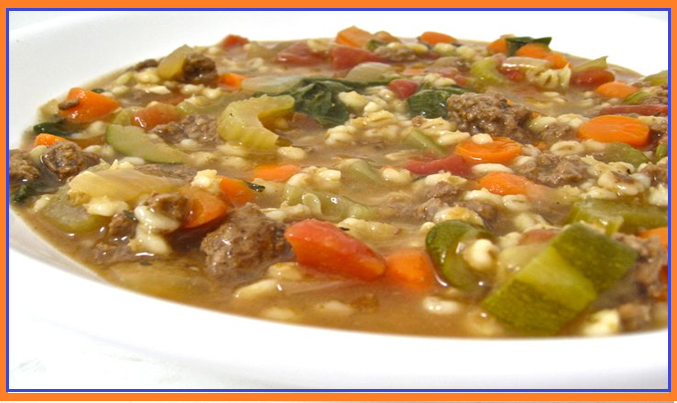 If you love a thick, flavorful, hearty soup, this one’s for you!!! Absolutely wonderful comfort food. I’ve included directions for cooking this easy, one dish meal either on the stove top or crock pot. Each 1½ cups serving has only 172 calories 2 grams of fat and 4 Weight Watchers POINTS PLUS. Serve with salad and you have a whole meal! 1. In a large nonstick pot or pan, brown ground beef. Pour into a colander in sink and drain fat. Add beef back to pot. Pour in all the beef broth, tomatoes and barley. Bring to a boil, turn down to simmer, cover pot and cook for 15 minutes. 3. Stir in spinach leaves and cook 2 minutes more. Remove the bay leaf. 4. This soup freezes great. 1. In a large nonstick pot or pan, brown ground beef. Pour into a colander in sink and drain fat. 2. Place beef and all ingredients in the crock pot, except spinach. Mix together well. 3. Cover and cook on LOW for 7-8 hours or for on HIGH heat for 3 1/2 hours until veggies and barley are soft. Stir in spinach, cover and cook on high for 15 minutes. Remove bay leaf. Pearled barley is high in cholesterol-lowering fiber and very low in fat. A single serving offers 11% of the RDA of iron and has a fair amount of folate and niacin.